Are you looking to promote awareness for a product or service? It’s time to shift your focus from display ads and pay-per-click programs and start delivering your message DIRECTLY to your target audience. Direct mail has proven itself extremely effective. A creative and interesting direct mail piece will break through all the marketing clutter and digital pollution. This does not mean that your direct mail piece should ignore the web. Today’s buyers still want to be directed to the web to gain further information about your company or to make a purchase. If you find yourself struggling for ideas to integrate your next direct mail piece with a web component, we’ve got you covered. Here are 4 ideas to get you started . . .
1. Include a direct link to your website or blog. If your direct mail piece generates interest, make it easy for the recipient to find you on the web. These links can be refined by creating short code versions from bitly.com or tinyurl.com. 2. Provide a QR code. Even though your message is being delivered by mail, the recipient may want to use a mobile device to view it at a later time. 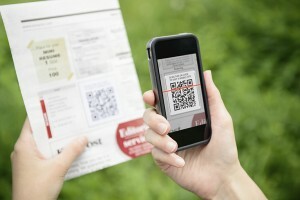 Implementing a QR code will allow customers to capture your web information right from their smartphone. Do you want to share a video or presentation from your website on your direct mail piece? QR codes are the perfect solution! 3. Use a personalized URL (PURL). This can really enhance the user experience by moving someone from a personalized printed piece to a personalized webpage. If your data supports it, you can program that webpage with preferences you already know about the client. Once the client gets to this personalized microsite, your business can easily acquire individual responses and data. Moving people from print to the web has other benefits as well. For example, if you capture a reader’s information because they filled out a form or signed up for a service from a direct mail piece, you can then begin an automated email campaign to remind them of your offer. Capturing your customers’ digital contact information can also provide you with additional opportunities to present them with other products or services that they might be interested in. Now you see . . . Direct mail is a communication channel that can be very effective if properly and creatively executed AND if it includes a web response component. It just takes a little planning to find the right “hook”! Want more ideas for how to improve the success of your next direct mail piece? Give us a call (262.790.5000). We’d be happy to help.